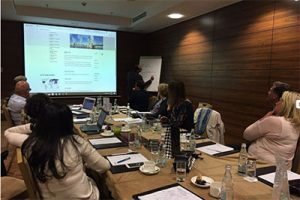 The latest board meeting of ER International, an integrated partnership of Human Resource consultants from across the globe, recently took place in Moscow. ERI operates as a global Executive Search network for cross-border projects. This ensures local expertise and support for any company seeking to recruit overseas. Through a strong network structure and cooperation between the partner firms of ERI, client organisations can utilise the knowledge and contacts of all the consultants in its member firms. The Principals of the firms within ERI – bfpeople is the UK partner – hold a board meeting twice a year to exchange ideas, share their expertise on local markets and collaborate with cross-border activities. Our Russian partner, Awara Group, hosted the event in Moscow which included many opportunities to discuss business as well as experience local culture and cuisine. ERI is a network of the world’s top executive recruiters and Human Resources consultants. Cross border and international recruitment is a challenge that is made easier with local assistance and knowledge. If you have recruitment, assessment or development requirements internationally, we will be pleased to faciliate the project through our ERI partners.